9.5/10 for The Ultimate !! 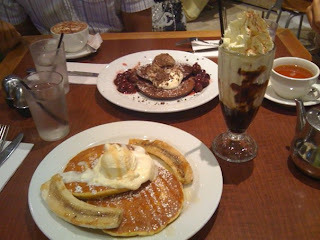 One of the best features of Pancakes On The Rocks is that it opens 24 hours, 7 days a week!! In Sydney, where everything closes after 5 (or 11 for pubs), it is a very good place to go if you can’t sleep at night ^_^ However, if you go there on weekends, be prepared to queue up for around 30 – 45 minutes. In terms of the food, they provide the best range and tasting for restaurant that open 24-hour, from pancakes to beef ribs. As their most-commonly ordered food, you can choose between buttermilk or chocolate pancakes. Normally, you would be presented with 2 stacks of pancake with flavour of your choice. As a personal favourite, I usually choose Bananarama if I want to eat the pancake. However, most people that I know choose Blueberry Heaven. I would suggest you to share the pancake with your mate because they are huge! 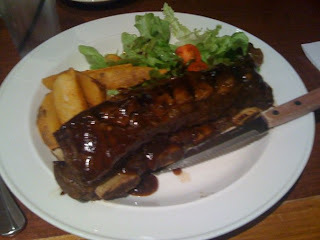 If you go to pancake to have dinner, I would suggest you to order their Beef Ribs. The ribs are so tender and juicy. You can easily cut through the meat as if slicing a sausage. The ribs are served in tangy barbecue sauce with a side dish of potato wedges and salad. I’d suggest you to add sour cream and sweet chilli sauce for the wedges. There is one particular menu that stands out above the rest, The Ultimate. They are not called The Ultimate for nothing, it is the best crepes (I know the irony being in pancake store) that I have ever tasted! You are presented with two perfect-sized crepes filled with crème cheese with a hint of sultanas. They are served with raspberry coulis topped with vanilla ice cream and a strawberry. Pancakes on The Rocks is located at the heart of Sydney’s most famous suburb (http://en.wikipedia.org/wiki/The_Rocks,_New_South_Wales). All of their restaurants are finely decorated with wooden floors and southern feel. Other range of food you can order there are Savoury crepes and pancakes, gourmet pizza, salads, and breakfast pancakes. They also provide kids menu for your children. This one too..I missed it!